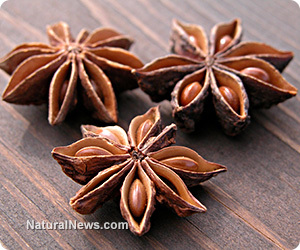 (NaturalNews) The Asian fruit Illicium verum, commonly called star anise, has been given recent prominence in the natural health world. The star anise has a characteristic licorice, anise-like flavor, although it is not related to the anise plants native to the Middle East and Mediterranean. Discover the great super health power found in the star anise plant. Star anise is a fruit picked off of a medium-sized evergreen tree in the northeast Vietnam and southwest China regions. It is also found in the southern region of New South Wales. The herb takes on an eight pointed star shape and is often used in Chinese, Vietnamese and Indian cuisine. It is also commonly used as a fragrance in natural cosmetics, soaps and toothpastes. Star anise is also revered in the culinary arts for its pungent flavor with hints of licorice and clove. It is used in a variety of dishes from beverages to deserts and savory stews. Many culinary artists use a single anise star to flavor an entire pot of stew or soup. Both the pods and the seeds are used for different purposes in the culinary arts and natural healing therapies. Star anise is the world's greatest source of the shikimic acid compound, which is also found in ginkgo, ginger, fennel and sweetgum fruit and is used by pharmaceutical companies to produce the anti-flu medication Tamiflu. The shikimic acid combines with other components in star anise to act as a neuraminidase inhibitor which blocks an enzyme that facilitates the replication of viral particles from body cells. A study published in the April 2008 issue of the Journal of Medical Virology showed that the combination of shikimic acid and the flavonoid quercetin ramped up immunity to fully resist viral infection. Several studies have also found that the compounds in star anise showed very strong antifungal and antimicrobial activity. Star anise also gets its distinctive sweet licorice flavor from a chemical compound called anethole. The anethole is helpful for digestion and improves symptoms of colic in babies and irritable bowel syndrome in adults. It is thought to activate enzymes within the body to improve the digestive process of proteins and fats. In this way, it reduces gas and bloating and improves nutritional absorption. Star anise is a warming spice that contains linalool and limonene, which are powerful terpene antioxidants. Linalool acts to protect the lipid bilayer of the cell membranes; it protects the arteries and improves blood flow. Limonene exerts strong anticancer activity within the body. These components also help improve energy levels and as an expectorant to cough up mucous associated with asthma, bronchitis, common cold and whooping cough. The combination of compounds including diantheole and photoantheole in star anise also promote lactation in nursing mothers. They also increase libido and help reduce symptoms associated with premenstrual syndrome. However, this herb should not be used during pregnancy due to its effect on female hormone levels and the potential for complications. This fruit can be used as a spice in a variety of dishes and taken as a supplement or in an organic fermented herbal tonic drink. Fermented herbal botanicals go through a two to four month process that activates the full nutritional potential in an organic acid base with live enzymes and probiotics. This is a revolutionary way to take in superfoods and herbs such as star anise.